Cabin staff at Ryanair will go on strike on Friday September 28 as part of what unions call ‘the biggest strike ever’ to hit the airline. Dutch cabin staff at Eindhoven airport will be joined by colleagues from Belgium, Germany, Italy, Spain and Portugal. Union FNV says cabin staff do not earn enough and are only paid for the hours worked on the plane. Hours worked as a result of delays are unpaid and often staff do not receive sick pay. Staff are also obliged to be on standby for eight hours at the airport in case they are needed, for which they are paid €30. Another grievance is that workers fall under Irish law instead of local law. The unions are giving Ryanair a final chance to prevent strike action and have called on shareholders to force the airline to make changes to its pay and conditions policy at the shareholders meeting on September 20. According to the Eindhovens Dagblad travellers should start looking for alternative ways of getting to their destinations. 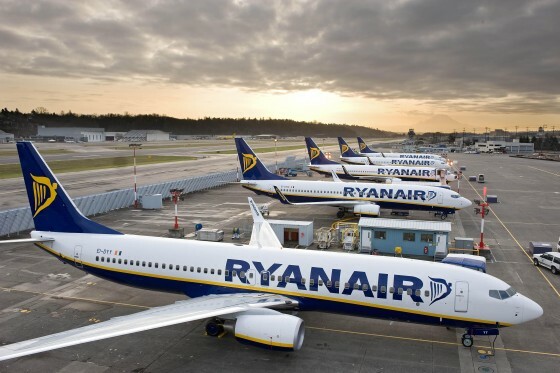 ‘A legal impediment to stop the strike, which was used by Ryanair when its Dutch pilots went on strike in August because of the late announcement, is now disallowed by the court. A strike means all four Ryanair planes stationed at Eindhoven airport will not fly,’ the paper writes. The strike action comes in the wake of a wave of industrial action against the airline, both by cabin staff and pilots. Ryanair employs 80 cabin staff and 40 pilots at its Eindhoven hub. Ryanair told DutchNews.nl in a statement that it rejected claims the strike would cause chaos. ‘Ryanair expects that even if there is another limited cabin crew strike on 28th September, the vast majority of its cabin crew across Europe will work as normal,’ the airline said.